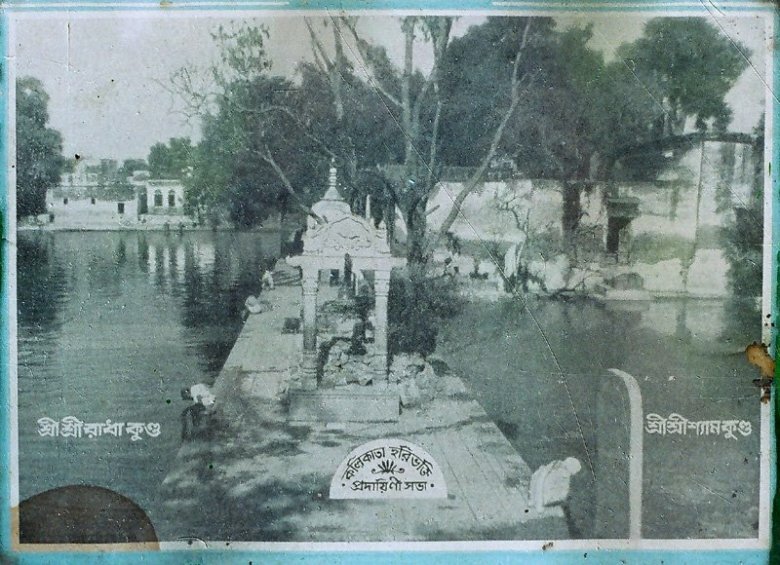 That very beautiful and fragrant Radha Kund, by whose mercy the desire vine of love for Krishna, which bears the flowers of service for my queen Shri Radha, instantly sprouts in the heart of anyone who performs devotional service there – this Radha Kund is my only shelter! Stavāmṛta Kaṇā Vyākhyā by Radha Kund Mahant Pandit Ananta Das Babaji Maharaj: Shri Kuṇḍāśrayī Shripada Raghunath has attained the greatest fixation in the kuṇḍa of his Prāṇeśvarī. In his heart pervaded by mahābhāva, he perceives the glorious sweetness of the kuṇḍa, which is as glorious as Radharani herself hundreds of times over. In the previous two verses Shri Raghunath described how Shri Govinda took shelter of the kuṇḍa in order to please Shri Radha and how glorious the kuṇḍa is because its service is dear even to Krishna. Love for Krishna is the crown jewel of all human pursuits, the great treasure of the spirit soul and the highest result of any human activity. It is the only thing that can permit one to relish Shri Krishna’s sweetness. Prema makes the otherwise supremely independent Krishna completely submissive to his surrendered devotee and prema can forever bless all the living entities, who are constitutionally Krishna’s eternal servants, by bestowing the bliss of devotional service on them. sei premā nṛ-loke nā hoy. Again, love of God, prema, the ultimate result of bhakti, is the highest aspiration for a living entity and is most rarely attained. It is the Lord’s svarūpa-śakti, or innate potency, being a combination of the essence of the hlādinī-śakti and the sandhinī-śakti. A fortunate soul who attains the grace of a great saint can enter into the workings of this innate potency of the Lord through the process of hearing, chanting and remembering the glories of the Lord. In this way the material dullness will disappear from the heart of the neophyte and everything will culminate in prema. Prema is the culmination of a whole sequence of spiritual advancement: Association with the saints, hearing and remembering the glories of the Lord, faith in the scriptures, obtaining the association of a qualified guru, taking initiation and instructions from him, surrendering and serving the guru and the Vaishnavas, serving the deity, aspiring for bhajana, earnestly practicing bhajana, having taste for bhajana, becoming attached to the Lord, bhāva and rati. This is attained by two kinds of fortunate souls: those who attain it on the strength of their own bhajana and those who attain it by the grace of Krishna or his devotees. This very rarely attained desire vine of love for Krishna, which is attained by grace, suddenly grows in the soil of the heart of any person (either qualified or unqualified) who serves Shri Radha Kund by bathing in it, seeing it, touching it, living on its banks or worshiping it, by the inconceivable potency and grace of the kuṇḍa. By the grace of the the service to the kuṇḍa the highest goal ever to be achieved by any sādhaka, mañjarī-bhāva or the loving devotional service to Shri Radha, grows up. No higher stage than this can be achieved for a person who treads the path of loving devotion. The maidservants of Shri Radha swim in an ocean of indescribable bliss when they relish the mellows of these devotional services. The practicing devotee is blessed if he attains this wealth of service and supreme love by the grace of serving the kuṇḍa.